I’ve had a pretty good run lately in the negative headache department. It surely feels good to have ideas and the energy to do something about them day after day. Today was my trip to town. I started off by stopping at my neighbor’s home to pick up a Lazy Boy chair they didn’t want anymore. It was too nice to throw away, but they had no way to haul it, so they asked if I knew of anyone that might like one. 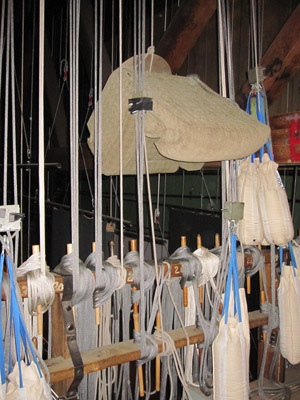 I asked around and learned the Calumet Theater would like it for the fly loft. All I had to do was get it up to Calumet, figure out a way to haul it up to the loft (about 30′ from the stage floor,) haul the old chair down from the loft and dispose of it. So around 7:30 I pulled my truck into the neighbor’s driveway with my 2 wheel cart. After some tugging and grunting we got out out onto the porch, and from there I was able to wheel it out to the truck, and lift it onto the bed. Then I tarped it, covered it with a cargo net and headed to the Feedmill Cafe for breakfast. It was just me and one other guy at the restaurant, and we had a nice visit while we ate. Then I took off for town. I arrived at the theater just in time, and between me and the theater manager, we got the chair off the truck and onto the stage floor. Then I headed up to the loft and sent down the service line. My partner tied the chair onto the line and sent encouraging words up to me as I grunted on the line and hoisted the chair. 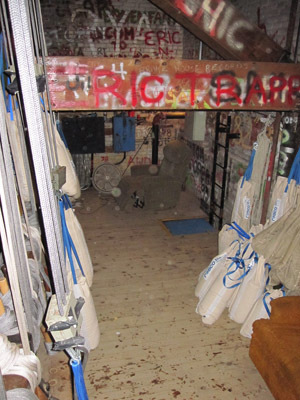 In this picture the chair is about eye level to me in the loft, but is probably 35′ above the stage floor just a few feet from where I’m standing. My challenge at this point was to spread the ropes aside so I could squeeze the chair between them, then lower it to the ground, untie it, and put it in its new home. Here the chair is tastefully arranged in its new (color-coordinated) space. One bonus… when I hauled the old throwaway chair down to the stage, a quarter fell out of the crack. I scooped it up. I forgot to take a picture of the old chair in order to give you an idea what a massive upgrade this furniture swap was. 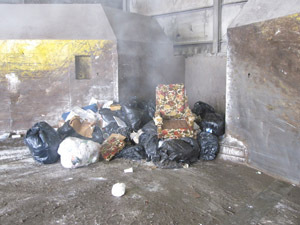 I finally remembered to snap a picture when I dropped it off at the Waste Management trash compactor this morning. After I got home and liberated a joyous dog, I put away the groceries and got my work duds on. 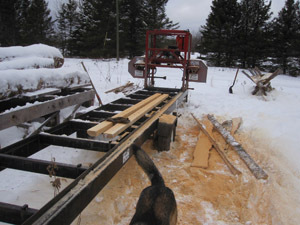 We fired up the sawmill and attempted to make some lumber out of the logs I’ve been hauling. I got two fairly good sized logs done this afternoon after about 2 1/2 hours of work. One reason it took so long is the sawmill has been sitting for a while now, and there are always kinks to work out. 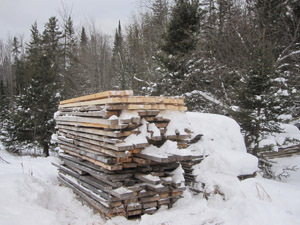 As you can see, I got some pretty nice 2x4s from these logs. The new 2x4s are the whiter colored ones on top. I think I got 23 done today. I think I’ll need another 100 10′ ones and about 40 16′ ones for the fenced in garden project I’m working on. This entry was posted on Wednesday, January 12th, 2011 at 9:23 pm and is filed under Uncategorized. You can follow any responses to this entry through the RSS 2.0 feed. You can leave a response, or trackback from your own site.